Whether for leisure or business, more travelers are seeking accommodations that mesh with sustainable values. Shipping container, recycled concrete pipe, or treetop – take your pick. Yes, this is an article about sustainable hospitality, and yes, the three strange options above are all types of hotels. A Days Inn hotel in Sioux Lookout, Northern Ontario, boasts of being the largest hotel in North America constructed with old shipping containers – 120 of them to be exact. In Sweden’s Lule River Valley, a venture called Treehotel offers rooms that are suspended up to six metres from the ground within a tall pine forest, while Tubohotel in Tepoztlán, Mexico, uses massive recycled concrete pipes as the housing for its 20 rooms, stacked in pyramids of three. These are all neat ideas – and great for eco-tourist types, the ones who research their destinations and seek out places that will connect them with nature and ease the guilt of consumerism in overdrive, otherwise known as the world in which we live. More important than these boutique hotels, however, is how more mainstream options for travel accommodations are embracing the sustainability imperative, either because they recognize efficiency equals cost savings or that more of their customers are demanding it – or both. “Over the last few years some hotels and many of the biggest hotel chains are trying to distinguish themselves as environmental-friendly players within the tourism sector,” wrote Tiago Diniz, a graduate student at the University of Edinburgh Business School in a 2012 study. 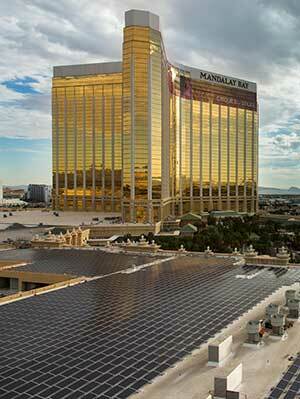 MGM Resort’s Mandalay Bay hotel has a massive 5 MW rooftop solar system. Indeed, other studies support this. According to the 2012 Canadian Travel Intentions Survey, 42 per cent of business travelers who took part said evidence of energy efficiency or recycling influences where they choose to stay. That figure was up significantly from just five per cent the previous year. The Hotel Association of Canada’s 2014 Travel Intentions Survey found that 44 per cent of Canadian business travelers felt eco-certification of hotels was important, up from 18 per cent in 2013. The rise and measurable benefits of Leadership in Energy and Environmental Design (LEED) certification for hotel buildings suggests the hospitality industry is beginning to take consumer expectations seriously. The certification is an independent, third party verification that the hotel or motel achieves high performance when it comes to energy and water use, indoor environmental quality, and materials selected during construction. Of note is that Canadian hotels appear to significantly lag their America cousins when it comes to LEED certification. According to the U.S. Green Building Council (USGBC), there were only six certified hotels in Canada as of June 2015, compared to 212 in the United States. Use of LEED by hotels is fairly new, but enough U.S. hotels have been certified to give an early sense of whether it makes both environmental and economic sense. A 2014 study out of Cornell University’s School of Hotel Administration compared the financial performance of 93 LEED-certified hotels with 514 non-certified competitors. “Certified hotels obtained superior financial performance,” concluded the study. The revenue boost could be seen across all hotel types, though the researchers conceded that most of the hotels in their study were upscale or luxury properties in urban or suburban settings. “This makes sense, because many of the LEED standards involve a hotel’s connection to public transit or other resources typical of urban areas,” said study co-author Rohit Verma. But even within particular locations, there can be huge differentiation between properties, according to another piece of Cornell research, which looked at monthly utility usage of more than 2,000 hotels across 30 geographic areas and analyzed them based on six energy and carbon key performance indicators. “For hotels with similar attributes and in the same city, energy per square meter can vary by more than a factor of five,” wrote researchers Howard Chong and Eric Ricaurte in their 2014 hotel sustainability benchmarking study. Evidence of the LEED impact will become clearer as more hotels embrace the standard. The Marriott chain and Starwood Hotels and Resorts’ Element brand, for example, have both made LEED standards mandatory for all new construction, and they’re not the only major chains to do so. Of course, LEED isn’t the only eco-rating in town either, and many hotels are at least attempting to go above and beyond. Back to Marriott: it has pledged to lower its energy and water consumption by 20 per cent by 2020. On top of that, it uses its influence in the industry to not just educate guests, but also to nudge hotel developers to build sustainability into projects from the start. Starwood, whose global headquarters has earned the highest LEED certification, has a similar water-reduction target, and aims to cut carbon emissions by 30 per cent in all of its properties globally within the next five years. Others are participating in specific initiatives or partnerships that help give them green bragging rights. More hotels are retrofitting to LED lighting, using eco-friendly cleaning products, purchasing biodegradable toiletries, and sourcing sustainable seafood and organic fruits and vegetables. W Hotels Worldwide, a part of Starwood, recently announced a partnership with music artist will.i.am and Coca Cola that will see bed sheets made of recycled plastic used in rooms across the chain, starting in North America. Each king size sheet contains the equivalent of 31 recycled 20 oz. plastic bottles. Applied to all beds at U.S. locations alone, that works out to 268,000 plastic bottles. The more keys held the higher the rated environmental performance, with each key “unlocking” guidance on how to obtain another key. Nearly 2,000 hotels now participate in the program, slightly more than half from Canada. “The industry is embracing sustainable initiatives on multiple levels,” managing director Tony Pollard stated earlier this year. Green Key Global is now working with the United Nations Environment Programme to get a better sense of what kind of sustainability information corporate travel agents and meeting planners are requesting from hotels. The motivation to engage in eco-initiatives and eco-labeling programs may, in part, be coming from the business world’s desire for “green meeting” places. Research shows that a growing number of corporate meeting planners are demanding that hotels used for conferences and business gathering meet minimum environmental standards. That’s where performance diverges from goals. 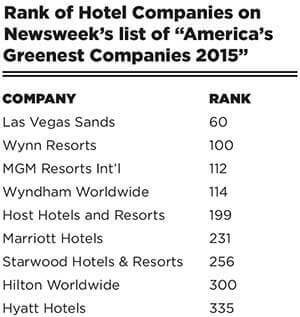 Marriott and Starwood are making some gains and big commitments on the ambition front, but of nine major hotel chains that ranked on Newsweek’s “America’s Greenest Companies 2015” list, both hotel brands were in the bottom half of the pack (keeping in mind that many hospitality companies didn’t even make the list). The list, a ranking of 500 publicly traded U.S. corporations developed in partnership with Corporate Knights Capital, assesses companies based on eight key performance sustainability indicators, including waste generation, water use, energy consumption and emissions. Las Vegas Sands has taken on some unique challenges. Its Sands Bethlehem property in Pennsylvania, opened in 2009, was built atop the largest brownfield site in the United States and home to the former Bethlehem Steel plant. The company helped the community restore the area, including cleaning up an adjacent river and nearby neighbourhoods with the help of volunteers. Others at the top of the list have pursued renewable energy, energy-efficiency projects, and worked to recycle toiletries so they can be sent to developing countries. Last year, MGM finished installation of a massive five-megawatt rooftop solar PV system at its Mandalay Bay Resort and Casino in Las Vegas. Wyndham has already reduced energy use at its North American properties by 12 per cent since joining the U.S. Department of Energy’s Better Buildings Challenge, launched in 2011. Hotels will be motivated to push harder on sustainability as competition with home sharing services intensifies. Airbnb, for example, argues that staying at a stranger’s home when on a trip is greener than going to a hotel. (As an aside, one guy even threw a mattress in the back of his Tesla Model S and listed it as a “private room” for $85 a night, though it turned out to be a hoax). 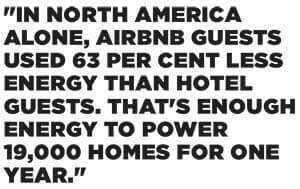 The basis of this claim is a 2014 study commissioned from the Cleantech Group consultancy, which analyzed over 8,000 survey responses from hosts and guests across Airbnb’s global network. It then compared those responses with traveler statistics gathered on hotels, and to be fair, it only used hotels that performed in the top 5th percentile with respect to energy use. The resulting report found that by using existing resources – that is, someone else’s paid-for, fully-equipped home – Airbnb users simply tend to consume lower amounts of water and energy and generate less waste. Is this out of respect for the host? One can only speculate. • When staying with an Airbnb host, guests are up to 15 per cent more likely to use public transit, walk, or cycle as their primary way of getting around than if they had stayed at a hotel. Airbnb acknowledged that its service might encourage people to travel more and stay away longer on trips, but argued that any increased environmental impact from this was offset by the benefits of home sharing. It’s tough to know for sure if there’s substance to these claims. The study was not scientifically rigorous and was based on many assumptions. However, one could make the argument that an online service such as Airbnb – having booked 40 million guests in 34,000 cities to date – has more capacity to influence green behaviour, and therefore outcomes. That influence is expected to extend into the corporate world with a program for business travelers launched in July that has signed up about 1,000 companies. As a single point of contact for millions of hosts and travelers, Airbnb can easily reach out to that community – whether it’s to educate, nudge or incent more sustainable behaviour. Such a powerful constituency can be harnessed to influence public policy and draw wider public awareness to environmental issues like climate change, as demonstrated by its “Make Every Day Earth Day” campaign. Last September, Airbnb teamed up with Nest and began offering free smart thermostats and energy monitoring services to select hosts in its network. “Airbnb wants to help hosts on their quest to be green,” said head of business development Lex Bayer when the partnership was announced. As part of a similarly structured deal announced in August, Tesla will supply discounted charging stations to certain Airbnb hosts as a way to accommodate Model S owners who may need an overnight charge-up. These are opportunities for Airbnb to green its brand, but also to experiment with ways to spread sustainable technologies and ideas throughout its community. That it recently hired Democratic political strategist Chris Lehane as head of its global policy and public affairs team is a sign of where it might take those experiments. Lehane is former press secretary to U.S. vice-president Al Gore, the Nobel-winning climate activist, and most recently has been leading California billionaire Tom Steyer’s climate action and anti-Keystone XL campaigns. It was a key hire, and given Lehane’s background on climate advocacy, it could lead to a bigger sustainability push for Airbnb as the company learns to better harness the influence of its broad and deep sharing community.